Decorative tile is placed around the perimeter of each pool and, as you would expect, there are different qualities of tile. Because of this, most companies give you a "Tile Budget". If you select the most expensive tile, there will be additional charges. We DO NOT have a "Tile Budget", and you may select the tile you prefer from over 60 Arturo's Pool Plastering samples. The placing of tile around your pool is a unique process and, when done properly, takes a full day. 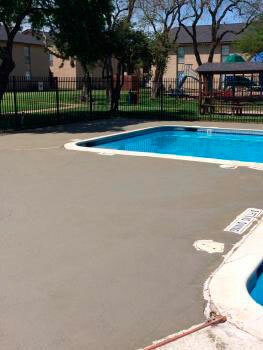 Using a mixture of concrete, the level of the pool is attained and the walls are smoothed. This mixture is then allowed to dry. Some people will try to speed up the drying process by putting dry Portland cement on the wet concrete. Arturo's Pool Plastering will not do this, as it creates air pockets in the mixture, thus weakening the tile base. Tile is then applied to this surfaces. In addition, we place Spot Tile on all steps (for an extra charge), benches and loveseats to ensure safety and create a more custom appearance. The final result is that your tile is applied in the proper and most effective manner, ensuring long life and durability. One of the most important aspects of the construction of your pool is the installation of the decorative trim. If it is not done correctly, trim work will not provide you with the functional and aesthetic quality of a truly fine pool. Arturo's Pool Plastering uses only the very best, highly-skilled professionals available, which gives your pool a mark of distinction. Only top quality stone is used. 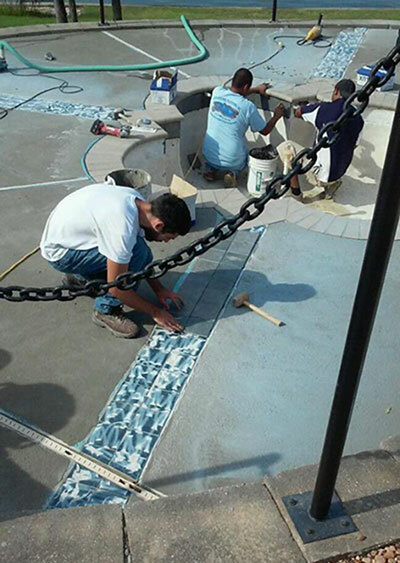 Each stone is individually trimmed and set on a twelve inch footing or on the edge of the deck for support. The joint between each stone is then smoothed, giving it a more defined appearance. Only top-quality brick are used and each joint is mitered so that every brick comes together in the desired manner. When retainer walls are required, they are constructed on previously poured concrete footings. Bricks are always placed in the back and front of the wall with a cap on top for the strongest and most attractive appearance. One of the most important aspects of constructing a pool is decorative coping. 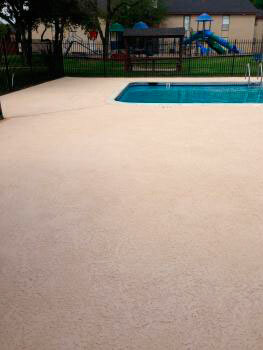 If it is not done properly, a potentially great looking pool will have only an average appearance. In addition, if copings are not installed correctly, they will have a tendency to separate from the pool structure at the point where they are affixed. This is usually caused by ground movement and is not covered under warranty by most companies. Arturo's Pool Plastering uses a special technique to minimize this problem and we employ the very best masons in the pool industry to ensure that our strict standards of quality control are met.